Gold Headed for Summer Seasonal Weakness? The gold market in the past has been seasonal, with the rule being, "Sell in May and go away". This lull in demand usually started in May and lasted until the middle-to-end of August, with the main demand appearing in the final quarter of the year and lasting until the end of May. Will it be the same this year? Bear in mind a big fall has happened already this last month. The heaviest influence on this seasonal pattern of gold has been jewelry demand from India, where as much as 850 tonnes of gold has been imported in past years. Their demand pattern is dominated by their weather; after May, crops have to be planted ready for the coming monsoons, bringing the crops to fruition in the early-to-middle parts of August. In the past, 70% of India's gold demand came from the agricultural sector, all of which is dependent on the weather. India gold is far more than just jewelry. It has religious connotations, as well as financial relevance. In a country where respect for the civil service, appliers of the law and the Tax authorities is extremely low, the attraction of changing your tax-free agricultural profits into gold and property and then slipping under the tax radar is often irresistible. But a key feature of this demand for gold is the jewelry a bride takes as a dowry into her marriage. In a nation where family remains the heart of society this gift from the bride's parents [for wives don't own assets, but can own cash] is to ensure that the new couple start their married life with financial security. 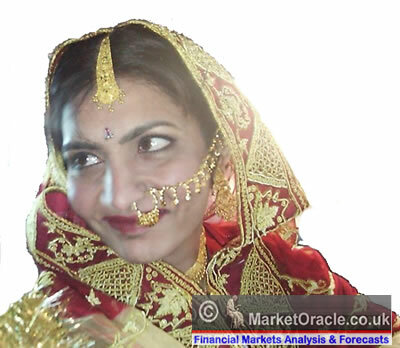 This makes the 'marriage season' [It is auspicious to marry in this season - tying in with religious beliefs], which comes to an end in the May, one of the important factors in the pattern of demand for gold. The climax of this demand is Akshaya Tritiya festival on the 7th May. It is similar in the developed West where the gold jewelry season also becomes becalmed as annual present-giving festivals are long way off at the end of the year. Gold then faces a global situation akin to the "Doldrums", a feature of the Atlantic Trade winds between South America and Africa, where the wind suddenly drops and leaves sailing ships becalmed until the Trade winds pick up again. But a glance at the last few years shows a distinct break in that pattern. Take a look at the chart just for the last couple of years, which serves for the purpose of illustrating our point. In 2007 in the middle of the end-May to beginning-September you can see the gold price suddenly begin to take off from $542.61 to the mid $600's from early June to mid-August and actually drifting until mid-October. 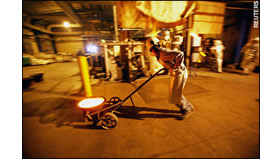 In 2008, the 'doldrums' returned and gold was uninteresting until the outbreak of the sub-prime crisis, but still ahead of the 'season' for gold. This is only the surface appearance of the events dictating the gold price. "The seasonality of gold is being slowly overtaken by macro-economic and monetary events that dictate the gold price today." Copyright 2008 Authentic Money. All Rights Reserved.